The Simpsons is the world's most popular entertainment phenomenon, regularly voted on both sides of the Atlantic as the best TV show ever made. 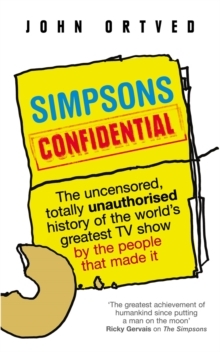 Simpsons Confidential is the uncensored, unauthorised oral history of the show from the people who made it happen. It takes you into the inner sanctum of the series to reveal the mechanics and politics of how The Simpsons became of global significance - from Matt Groening drawing his first Homer on the ride over to pitch the show, to Conan O'Brien and the other Harvard comedy geniuses taking us into the daily life of the writing room. Animators, writers, actors, directors, producers, executives and celebrity guest stars - everyone from Rupert Murdoch down - all offer their opinions, insights and stories. Positively fizzing with indiscretions and intrigue, here at last is the book that legions of Simpsons fans have been waiting for.